The ETI Moisture Alert therma-hygrometer has a LCD display which indicates either the humidity (20 to 95% RH) or temperature (0 to 49.9°C). 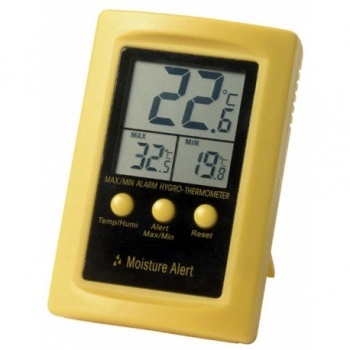 The Moisture Alert hygrometer thermometer is great for keeping an eye on the humidity in buildings and housing or almost anywhere that the humidity, moisture or dampness is a problem and need to be look at. The ETI Moisture Alert has a pre-set audible max/ min alarm for both humidity and temperature. The alert alarm will automatically sound if the humidity rises above 70% RH or falls below 25% RH. If the temperature exceeds 40°C or falls below 1°C the alert will sound once set. Needed a portable room 'stat to adjust underfloor heating thermostats to reflect mid point room temperature rather than perimeter temp. This is perfect. Quickly adjusting to different temperatures. Max/Min is a nice touch. Haven't used humidity readouts but nice to have all the same. Just the job. Thankyou.